Bathroom worktops, often referred as vanity tops, don’t have to be boring. 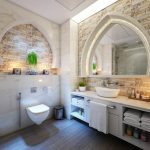 Since much emphasis is placed on kitchen worktops such as materials, design, etc., these bathroom vanity tops have taken the backseat. 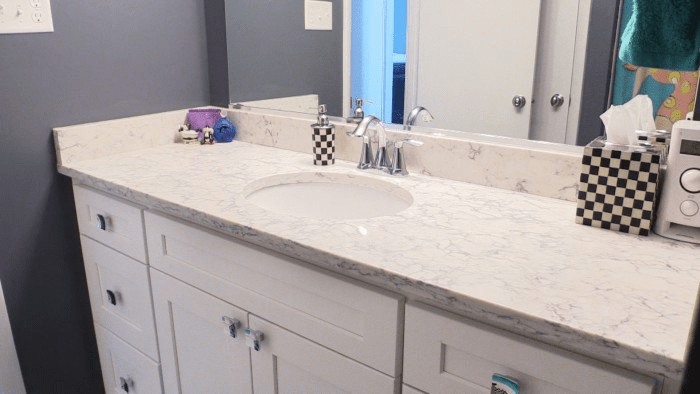 Choosing the perfect vanity top for your bathroom is not as difficult as it may seem. However, it does warrant patience and time. 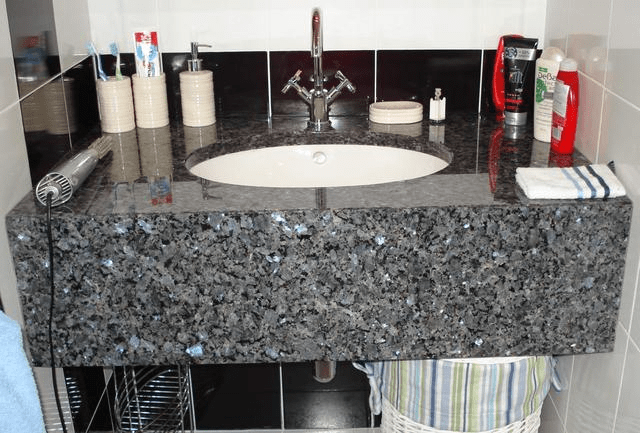 You have to take into account that materials, from natural stone to quartz worktops, need to be both durable and capable of standing up to soap, water and cosmetics (assuming you love makeup). 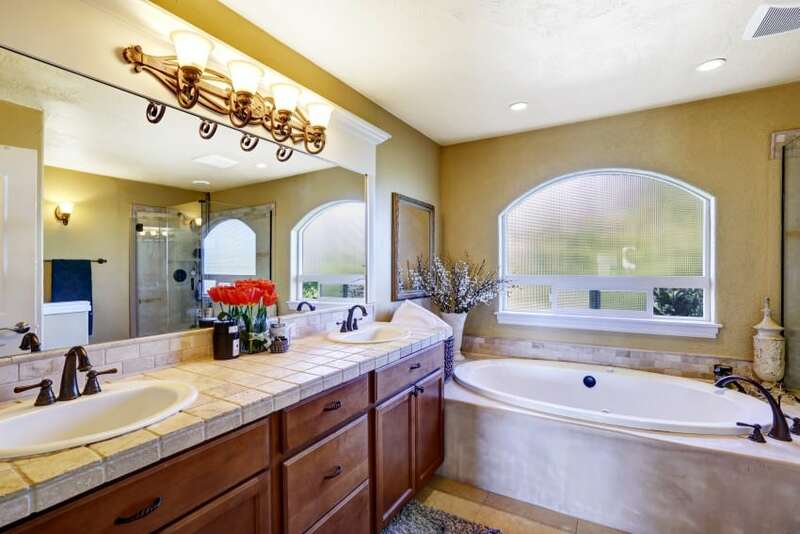 Remember that the vanity tops could also serve as your bathroom’s focal point. There are a considerable number of available options in the market today. 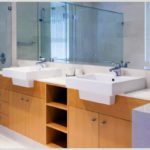 However, the type of material you choose for your bathroom will determine the options for the overall dimensions, design, colour and edge treatment. So here are the top 5 bathroom worktops for your kitchen, ranked from good to best. 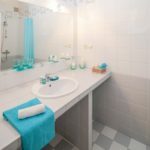 If you really want options and are on a seemingly tight budget, then ceramic tiles is for you, although interior designers are debating whether or not installing tiles for your bathroom counter is a wise decision or not. One major advantage tiles has over other materials is the cost. Installation can also become a DIY project if you don’t want to spend much on labour. The plus side, individual damaged tiles can be replaced, extending your counter’s lifespan. Ceramic tiles also come in wide range of patterns, colours and design options. In fact, you can customise your vanity tops with individual patterns. There is a drawback to all this, however. Although ceramic tiles are resistant to stain, heat, moisture and scratch at a certain degree, grout lines could trap dirt and become a breeding ground for mildew. Proper sealing and maintenance are required to prevent this. However, if you can get past the required upkeep, you can use ceramic tiles for a bright, bold or subdued and sophisticated bathroom look. Considered by many as the most practical material, laminate is in fact the cheapest worktop material in the market. Additionally, installation could as easily become a DIY endeavour. Laminate has long been around and used as vanity top material since the 1960s and 1970s. However, thanks to advancements in manufacturing, this budget-friendly material no longer sports the garish colours and widely visible seams common decades ago. Modern laminate is stylish, so to speak. In fact, up close, it can pull off mimicking natural stones such as granite. Yet it still has that insubstantial and hollow feeling, courtesy of the MDF core base (particleboard). 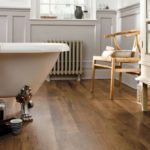 If you can get past that, laminate is an economical, got-to bathroom worktop material. It’s versatile and available in a vast variety of patterns and colours. It is stain-proof and can stand up to water. The only other drawback is when it’s worn-out or damaged, the entire laminate top will need to be replaced. 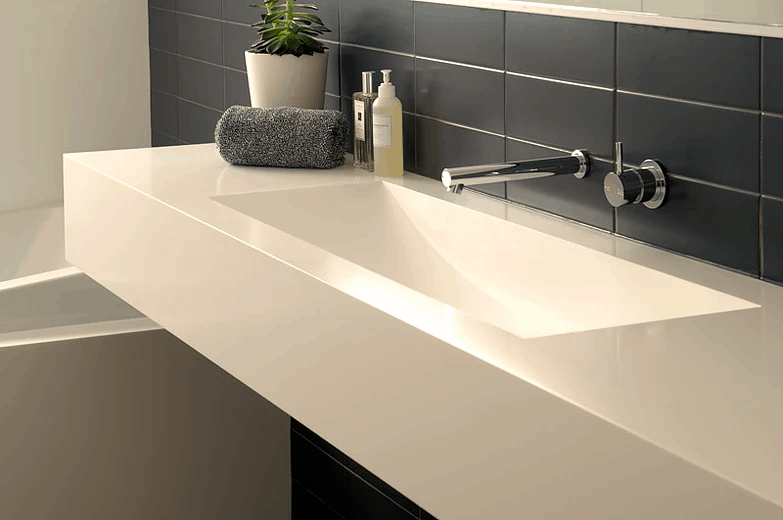 As the industry term for man-made surface, solid surface combines functionality and flexibility with true style. In fact, this material has been a popular choice for bathroom worktops. It is made of synthetic materials, mixed with acrylic resin, crushed stone and even quartz. Sometimes, streaking or flecking is incorporated to achieve the appearance of natural stone surfaces. 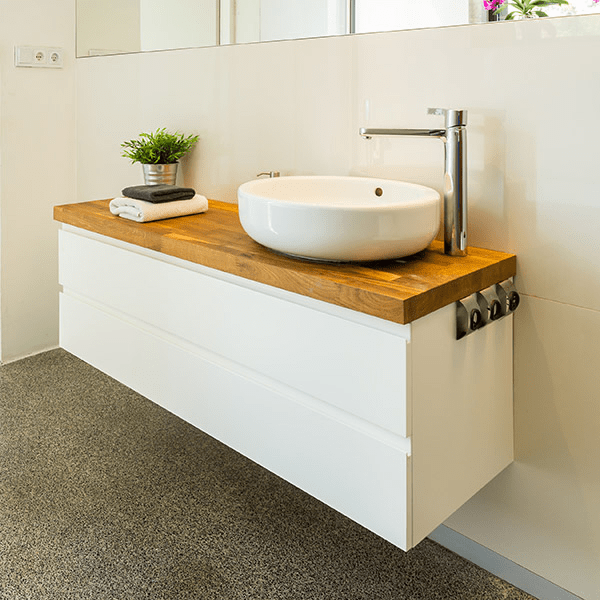 Because of the mixture of resins and other materials, solid surface is resistant to water, stain and even bacteria. In fact, no sealing is required. However, this surface can indeed scorch. Scratches are also more visible compared with other surfaces, yet they can be buffed out using fine-grade sandpaper. Solid surfaces come in all sorts of colours, styles and patterns. Professional installation is required, however. And they don’t come cheap. Granite is the most desired worktop material, because of its dramatic beauty, unique patterns and hues, durability and its overall attractiveness. But above all that, granite increases the home’s value. Each granite slab has its own individual colour and striation. So if you happen to pick out a specific granite slab, you might want to reserve it because chances are, you’re not going to find any other pattern similar to it. Notable for its hardness, granite is also resistant to heat, humidity and scratches, given it is properly sealed upon installation. 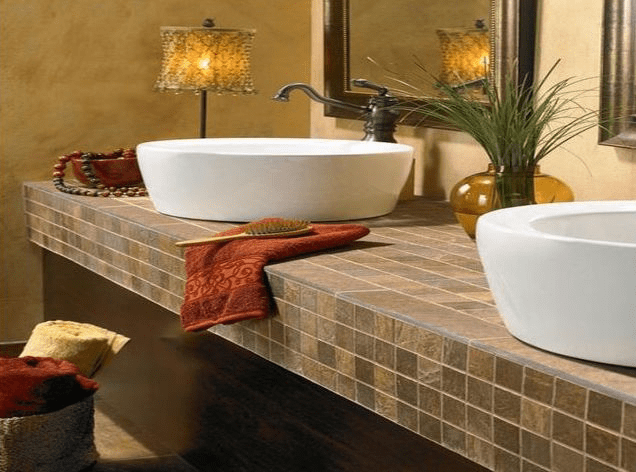 This natural stone surface can definitely hold up to everyday bathroom abuse. One of the downsides of granite is the periodic upkeep required. You have to regularly have your surface re-sealed so that it will last for generations. Another is, although not specifically considered a downside by some, granite’s hefty price range. 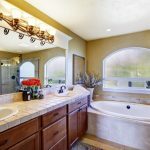 Other than that, you can’t go wrong with a beautiful, durable and highly desirable stone surface for your bathroom counter. Quartz is an “engineered stone”, composed of 93% to 95% natural quartz crystals, with the rest comprising polymer resins and pigments. Unlike granite, this engineered stone doesn’t require sealing and is naturally waterproof and stain resistant. Additionally, it is hard-wearing. Its non-porous surface inhibits the growth of bacteria, mould and mildew, making quartz hygienic even for bathroom purposes. However, most quartz are as expensive as granite, with leading brands being Cambria and DuPont Zodiaq. Since it is an engineered stone, quartz patterns and colours can be customised per customer’s request. In fact, some high-end brands manufacture quartz surfaces that mimic the look of marble and granite. Remember that the bathroom is no place for easy-to-stain or porous and delicate surfaces. Also, think how quartz worktops, for example, would look against your bathroom sink, cabinets and other important design features. Take home samples so you’ll be more than pleased with your ultimate decision.